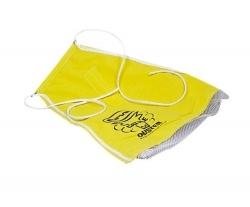 Durvet A Line Dust Bag livestock fly control product is a durable, easy-to-load cattle dust bag featuring a unique flicker chamber to assure an even spread of dust over the animal. Recharges with dust as bag drops off animals’ hindquarters when they pass under it. Also has convenient 2-point attachment for easy hanging, a steel spreader bar to assure bag will not turn sideways in lane and rope protected edges for long wear and extra strength.